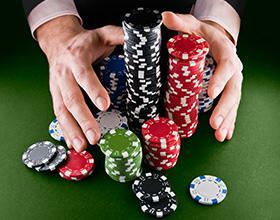 With the World Series of Poker now underway, it’s perfectly natural to want to play poker. You can’t read online casino news without hearing about who won which bracelet, and now that the Main Event is just days away, the news is about to get more packed. But we get it. You love Blackjack. You love Roulette. You’re a huge fan of the slots. But poker? It seems too complicated. Relax. Poker is easy, especially if you start with a few select games. Today, we’re walking you through a few easy picks, including the most popular poker game on the planet and the star of the Main Event of the World Series of Poker. If you’re new to poker and you’re feeling a bit intimidated by playing against actual people, we recommend starting with video poker. You can find a huge selection of video poker games at Palace of Chance, but the easiest one to start with is Jacks or Better. The game is simple. Start off by placing your bet. You’ll receive five cards, each one of them face up. Unlike other poker games where you’re playing against the house or against other players, in Jacks or Better you play against yourself. Your goal, simply, is to have a hand that ranks on the hand ranking system. As long as you rank, you’ll get paid. But here’s the best part. Your initial five cards don’t necessarily have to be your hand. That’s because with Jacks or Better, you can get rid of all five cards and replace them with new ones. You’ll definitely want to hold cards if you’ve got a pair of Jacks or anything better, but the luxury that comes with being able to swap your cards is a pretty big deal. It’s arguably the biggest game in the world, with tens of millions of people all over the world playing it in basements, online, and in live tournaments. Heck, the world’s biggest poker tournament that’s about to get underway in Las Vegas is all about Texas Hold’em. Sure, the WSOP has a bunch of other tournaments, but the event everyone dreams of winning is the Main Event No Limit Hold’em tournament. You might think that Texas Hold’em isn’t a beginner’s game, but that couldn’t be further from the truth. You see, Texas Hold’em is so easy to learn that amateurs can feel like pros playing online and winning their way to Las Vegas. Texas Hold’em is a real blast because you sort of know what everyone is holding. In Texas Hold’em, everyone gets two hole cards that they don’t share with other players. So how do win with just two cards? Well, those aren’t your only cards. All players share in 5 community cards. Your job is to make the best hand using a combination of your two cards and the five community cards. The community cards don’t drop all at once. Instead, three drop at once, followed by a round of betting, followed by the 4th card, followed by more betting, followed by the 5th card, and then, you guessed it, more betting. There’s also a betting round before the first three cards drop. If you’ve got a great hand, you can either sucker people in to betting more or bully them out of the hand of you don’t know that your hand is guaranteed to win after the other cards drop. Texas Hold’em is hugely popular not just because it’s fun, but also because there’s a potential to win a lot of money. Some of the world’s top poker players have won tens of millions of dollars playing Texas Hold’em and other peer-to-peer poker games on the live poker tournament circuit. And some of the world’s biggest online poker sites offer players that chance to win a piece of millions in prize money every single week. You can even win your way to live poker tournaments by playing in an online satellite. If 5 cards seems like too many for you to wrap your head around, check out Tri Card Poker at Palace of Chance. It’s a poker game where you only have three cards to worry about. This one pits you against the dealer for a winner take all match. Start by placing your ante. Let’s say it’s $5. Once you hit Deal, you’ll receive three cards. If you like your hand, you simple hit the Raise button, which commits another $5 to the pot. If your hand is better than the dealer’s hand, you’ll win 1:1 payouts on both your ante bet and your raise bet. Here at Palace of Chance, you can play Tri Card Poker and a number of different video poker variations, all from the comforts of home. Start by creating your free Palace of Chance account. We only require a few pieces of information to help you get going. Once you’ve got your account, feel free to check out all the poker games on offer. Remember, you can play all of our casino games for free, all without having to make a single deposit. When you are ready to play for real money, we accept a variety of payment options including credit cards, so you can hit the real money poker tables in no time. Plus, you’ll also qualify for our welcome bonus as a new player. We can’t wait to see you online—and to find out how good of a poker player you really are.